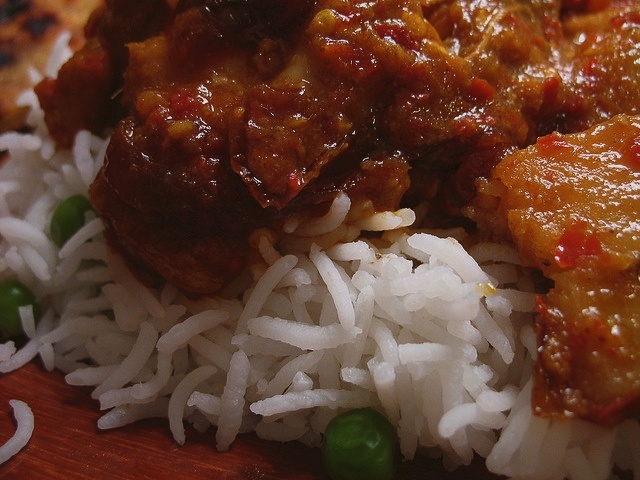 Vindaloo is a hot and spicy dish from the Goa region of India. There are many variations of the vindaloo recipe. Authentic Goan vindaloo is not a curry but more of a dry sauce-based dish, which tastes better as it ages. Source. – A Pub that serve this dish in Singapore – Bojangles. Fry ground garlic (b) till slghtly brown. Add ground ginger (c) and mustard seeds (d). Add chicken and salt. Fry for a few mins., add a little water, and cover pan. When chicken is almost cooked, add vinegar and sugar, according to taste. Simmer chicken till chicken is tender. (This is a dry curry). I’ve just come across your blog and absolutely love it. This recipe looks delish! Can’t wait to try it! this dish should go with pork. vindaloo taste better with lard.